When the Health Insurance Portability & Accountability Act (HIPAA) took effect in 2001, healthcare organizations struggled to implement technical safeguards to ensure the confidentiality and integrity of their patients’ private health-related information. If you are one of these healthcare organizations, it’s important to know that the number of HIPAA data breaches has soared 138%. As these data breaches increase, healthcare organizations are looking for ways to stay compliant with HIPAA regulations. 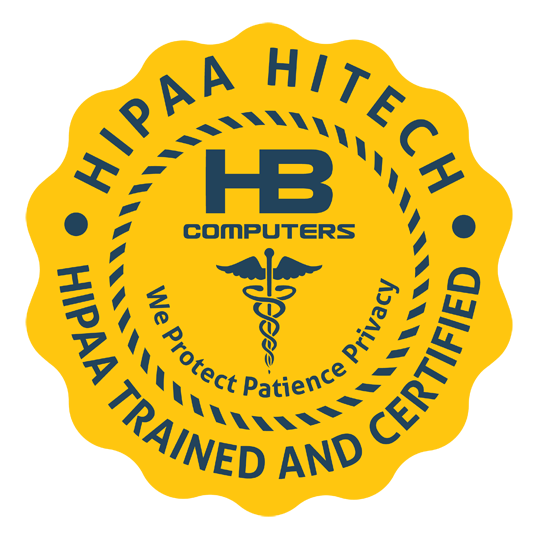 HB Computers is HIPAA trained and certified to take care of all of your data security needs. We have the capacity and the experience to provide a full range of comprehensive HIPAA compliance solutions so that you will not be subject to hefty fines, loss of patient confidence, damaged reputation and even possible organization closure. We are extremely proud of our competency in this important segment of our work and look forward to helping you stay abreast of and staying compliant with HIPAA regulations. We take pride in the fact that we have the capacity to provide HIPAA solutions for the medical community. In this digital age, protecting patient information and records is more important than ever! We have forged solid relationships with medical personnel, locally and beyond, and have earned their trust. They rely on us to keep their systems functioning smoothly with the most effective security and privacy safeguards available. We look forward to serving you as well! Please access our HIPAA Agreement for Doctors and Hospitals by clicking the following link. Simply complete the form, print, sign and then return it to us either by mail or email as a scanned attachment. If you have any questions, please don’t hesitate to call us. Thank you for your interest in our HIPAA-compliant IT services! We look forward to making sure that your computer system and network will always be running safely and at peak performance 24/7, 365 days a year. Don’t risk your patients’ confidentiality or your organization’s reputation! Call us today at 714-969-3001 or email us at Support@HBComputerZ.com to learn more about how HB Computers can help your organization remain HIPAA compliant!